Sergei Yesenin (also spelled Esenin) was a troubled russian poet and ladies’ man who married 4 times before the age of 30 (there are accounts of up to 8!). He’s also known to have had several male lovers. He had four children from three different women, the last one he never got to see. Sergei was a rebellious writer and suffered through bouts of alcoholism, violent behavior and depression. He wrote his last poem Goodbye, my friend, goodbye after binging on vodka for two days, and using his own blood for ink after slitting a wrist. He then hanged himself. Sergei was only 30. Unfortunately his suicide inspired copycats, a lover of his even hanging herself on a tree by his tomb a year later. And his writings were banned for years after his death. Here’s a great, in-depth blog post by a fellow WordPress blogger which sheds more light on the deeply flawed poet. Let’s have no sadness — furrowed brow. 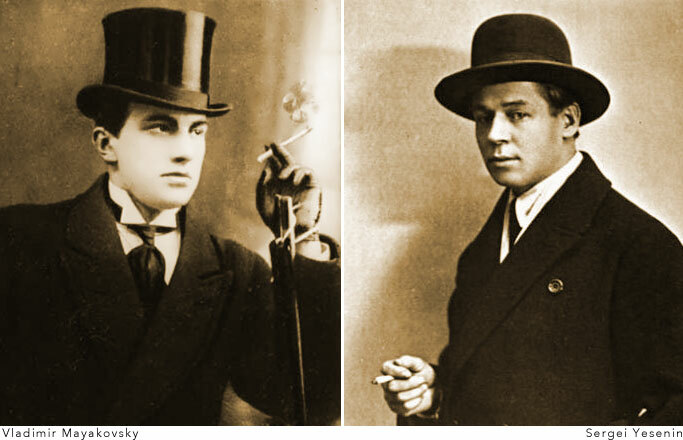 The poet Vladimir Mayakovsky was so deeply affected by Sergei’s suicide he wrote his own poem he titled To Sergei Esenin. The poem talks of Sergei’s alcoholism with deep empathy and sadness. But then he goes on to say had Sergei have more class he may not have been so talented. He himself had a troubled life, going to prison four different times in his teens and inciting prisoners to disobedience. But that was not all for naught; solitary was where he first began to write. Five years after Sergei’s suicide, Vladimir became involved in a stormy relationship with actress Veronika Polonskaya. At the time he was going through some professional failures and after a heated argument with his lover he went against his own poem lamenting the uselessness of suicide, and shot himself in the chest at the age of 37. Forward march! That time may whistle by as rockets flare. only the ruffling of our hair. Though their lives were full of strife they each had incredible talent and eventually became respected Russian poets post mortem with both getting statues to commemorate them. This entry was posted on Wednesday, April 1st, 2015 at 12:59 am	and tagged with 1910s-1920s, europe, gay, Poet, Russia, Sergei Esenin, Sergei Yesenin, Vladimir Mayakovsky and posted in Bad Boys, Others. You can follow any responses to this entry through the RSS 2.0 feed. Sergei Yesenin « Grumpy old fart!!! Yesenin did not have male lovers !!! It was his friends who were also neighbors in the room.